Kenyan duo took the top honours in Belfast as Northern Ireland’s Laura Graham finished second woman. 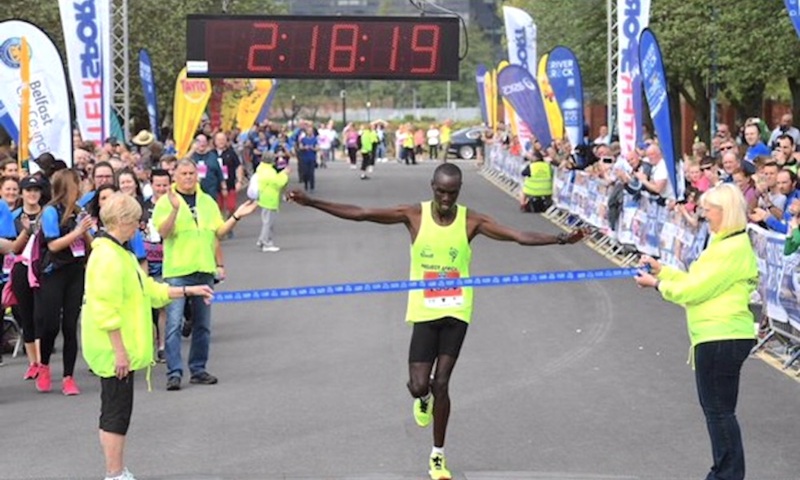 Eric Koech and Caroline Jepchirchir made it a Kenyan double as Project Africa athletes dominated the 37th and possibly last ever Belfast City Marathon on Monday (May 7). 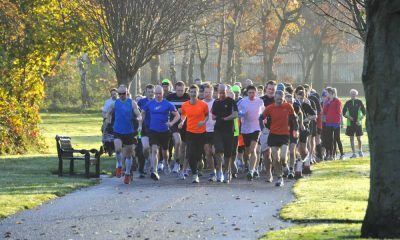 Upwards of 3000 started the full 26.2 mile distance while ancillary events took participation numbers up to around 17,000 runners, making it the largest mass event of its kind in Northern Ireland. Held in perfect calm and cool running conditions, Kenyan Koech finished strongly to cross the line in 2:18:19 and thwart compatriot Joel Kipsang Kositany’s hopes of a fourth victory in the race. The pair had run shoulder to shoulder for most of the trip but Koech, second in 2016, proved the stronger as Kositany faded to third in the later stages. 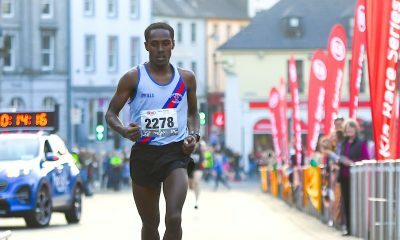 That allowed team mate Dan Tanui, runner-up 12 months earlier, to come through for second and complete a 1-2 for the athletes, managed by local coach Ciaran Collins, who have been prominent in road races throughout Ireland and beyond in the past few years. The first Irish runner was Eoin Callaghan of the Star of the Sea club who was fourth in 2:27:23, while Olympic walker Colin Griffin was fifth in 2:29:15. 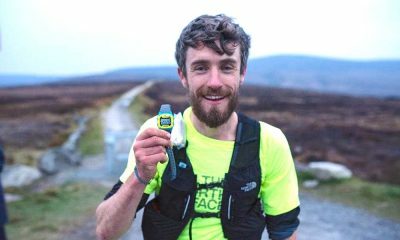 Bristol & West athlete Jarlath McKenna took sixth for the third consecutive year in 2:30:45 to claim the prize for first Northern Ireland finisher. Caroline Kepchirchir claimed the women’s title in 2:41.23 but only after overcoming stern opposition from defending champion and local favourite Laura Graham. Well done to our top 3 ladies winners! The 32-year-old Kilkeel woman ran knowing she could be risking the wrath of the Irish selectors who named her only ten days earlier in the team to represent Ireland in the marathon at the European Championships this August. Graham kept her Kenyan rival in sight until after the 20-mile mark when Kechirchir, encouraged by Collins on a bike at her side, slipped away to win by over two minutes. The Mourne Runner finished in 2:43:34, over six minutes outside of her personal best recorded in Berlin last September. First of the wheelchair athletes in 2:07:10 was many times previous winner Paul Hannon. Meanwhile, the organisers of the Belfast City Marathon warned that it could be the last time the event is staged because of new legislation. 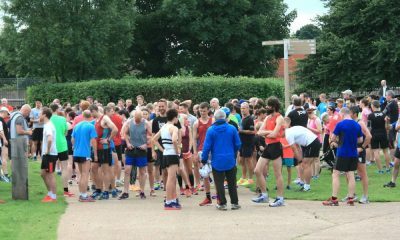 Committee chairman, David Seaton, said they were informed that in future they may have to pay for policing which would make the event unviable from a financial viewpoint. “The new road legislation means we’re going to have pay for policing costs among other things,” Seaton told the BBC. “I’m told that an officer is charged out at £65 an hour and on bank holiday Monday it’s twice that. That’s £130. “They are usually on duty for seven to eight hours so that’s about a thousand pounds each. Last year we had about 120 officers, that’s £120,000. We couldn’t take that hit. That would be the end of the marathon,” Seaton concluded. The race had been due to have a facelift in 2019 with a move to a Sunday and new course taking out the tough outward section along the Antrim Road. All that may now be hypothetical unless some accommodation can be reached with the Northern Ireland Police Service.